Custom Design Metal Arts by Bill Roberts, Artist Metalsmith. I originally started the pattern making in clay. Quickly found I wasn't satisfied with the detail I was able to get (and keep). So switched over to wax, starting first with a soft wax that you could manipulate. So I could "forge" it. Still trying to do it the "old" way. 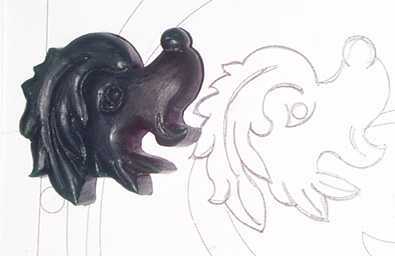 To get the detail worthy of making molds and taking the project to the next level. I settled on Hard Carving Waxes, which enables you to get unbelievable detail. I felt I was truely making "house jewelry" for the first time since I started this metalsmithing journey. 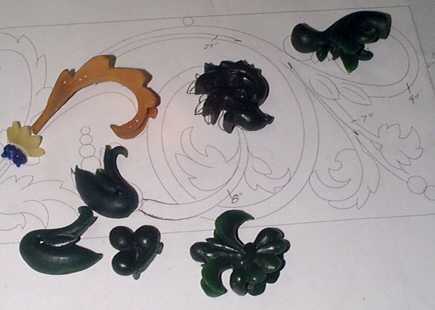 Once you have a scale drawing of the elements, you just transfer them to slabs of carving wax. This gives you the basic outline and most of the detail lines.